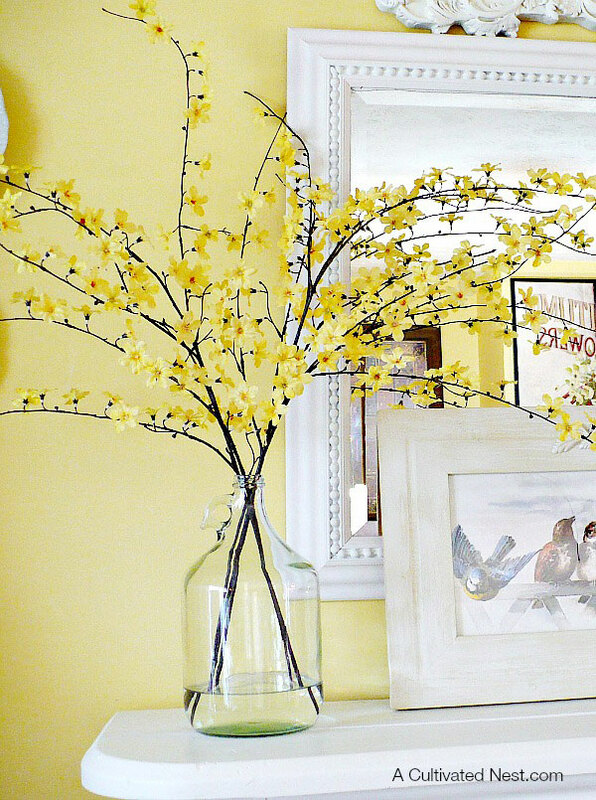 Forcing flowering branches to bloom is one of the easiest ways to bring spring inside! Includes easy instructions on how and when to cut your branches and tips on arranging them. This time of year I always try to bring a little bit of the outdoors inside. Especially when Mother Nature smacks me upside the head with a few snowballs like she did last weekend. 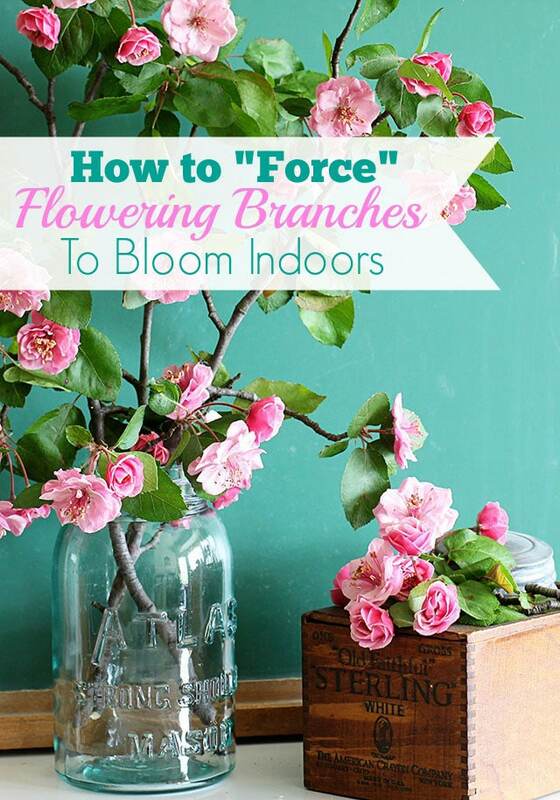 And one of my favorite ways to do this is by forcing flowering branches to bloom indoors. Yes, tree branches inside the house!!! And it’s so easy it’s silly! 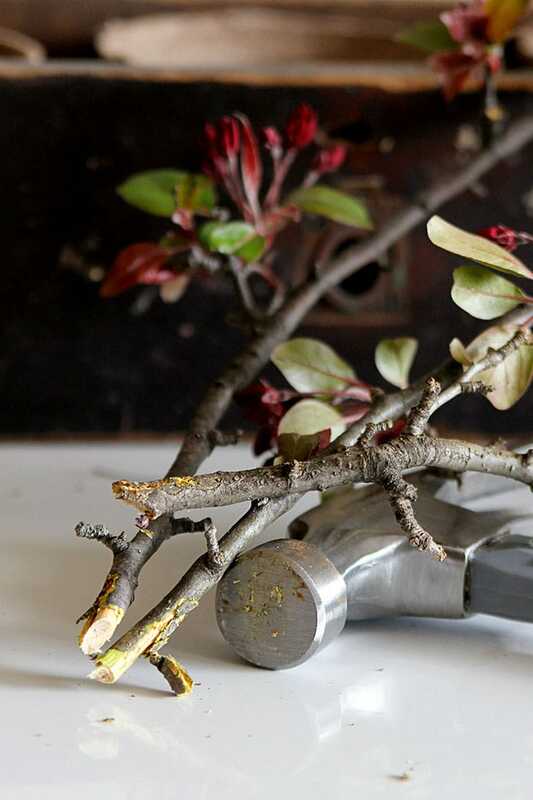 You can cut branches in late winter before buds are showing and wait and wait and wait for them to bloom. Or as I prefer, wait until spring to cut the branches when you see buds just starting to plump up and almost open. Much less wait time for your blooms! The closer you cut the branch to its natural bloom time, the quicker the flowers will bloom inside the house for you. 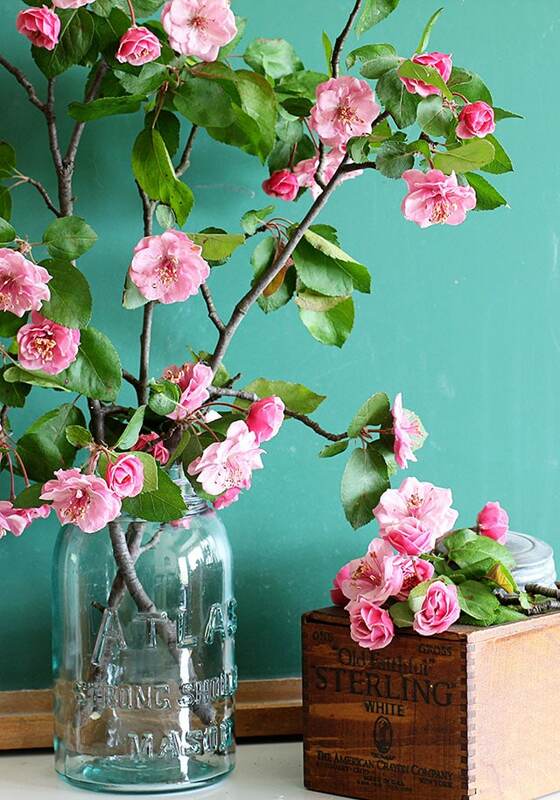 Arrange branches in tall vases, canisters or narrow mouthed jugs. Mason jars work just fine also! Fill vases with a few inches of water and keep the water fresh. Putting your arrangements in a cool spot out of direct sunlight can help to make the blooms last longer. Speaking of great vases, Manuela from A Cultivated Nest has a great idea of turning a glass apple juice jug into a stunning Pottery Barn inspired vase for spring branches. I checked and my local Krogers has glass jugs of apple juice in their healthy/organic/tastes-like-cardboard foods section. You can also buy the juice in glass jugs at Whole Foods. Have you forced flowering branches before? 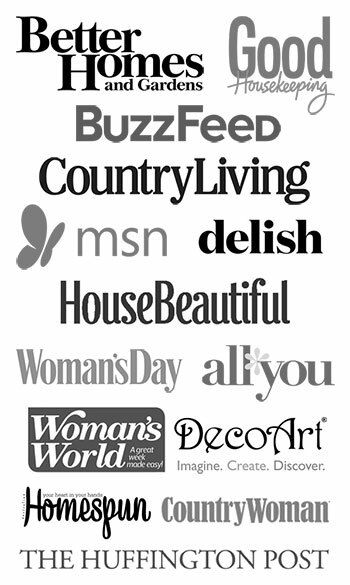 What’s you favorite one to force? And BTW, forcing sounds so violent! It’s such a harsh word for such a pretty thing! So pretty, Pam! I’ve never tried this, but my cherry tree is looking ready…maybe I’ll cut some from the apple trees, too. Thanks! Glad you are feeling better! Give it a try. My crabapple blooms normally last a few weeks! That is just beautiful! I can’t believe I’ve never done this. Only tried it once and one of the walls in my house filled with teeny tiny bugs. Took forever to get rid of them. I have no luck bringing the outdoors in. But I wish I had your green thumb. Those flowering branches look lovely, indeed. Oh no, I’ve never had a bug issue before! Maybe it’s best to keep the outdoors outside in your case! The photos of your flowering branches are gorgeous, Pam! I’m sorry to say, but my choices of branches are now limited since we had to cut down our flowering crab and apple tree. Sniff, sniff. 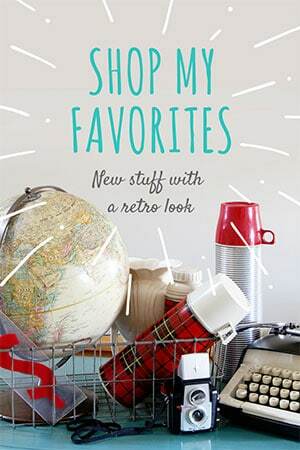 I am totally trying this idea! 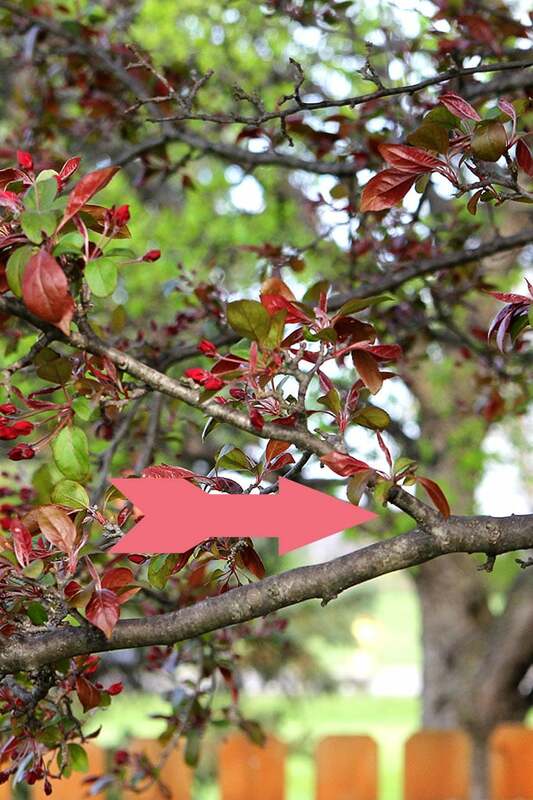 We just moved to a rental house and I am pretty sure there is a dogwood tree in the backyard. Hi, I have forsythia in leaf, I will bring that indoors, I have done it many times, such a pretty yellow! So beautiful Pam and sadly we don’t have any flowering branches way down south here. Forced to faux!